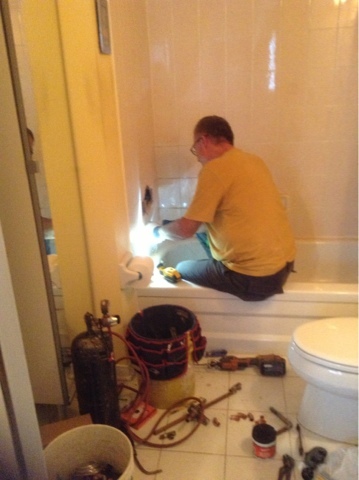 Ok, so, this is not strictly kitchen renovation related, but the plumbers were here today specifically to put in a pressure-balanced valve in the master bath. We fixed the guest bath when we moved in, but never got around to doing the one in ours. Scott (from yesterday) and Andy (owner of the plumbing company) came by today and took about an hour and a half to fix something that has been driving me nuts for 8 years. 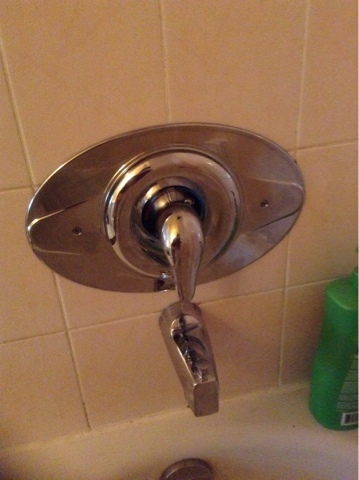 I'll never have to yell "I'm out" after a shower again! This is the end result. Not fancy, but very functional. But, what's happening with the entire first floor, you ask? The dining room is DONE. Jamie declares it so, and so it must be. 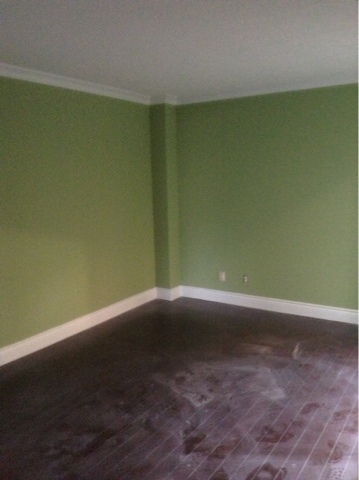 Dining room? DONE! Note the distinct lack of refrigerator. 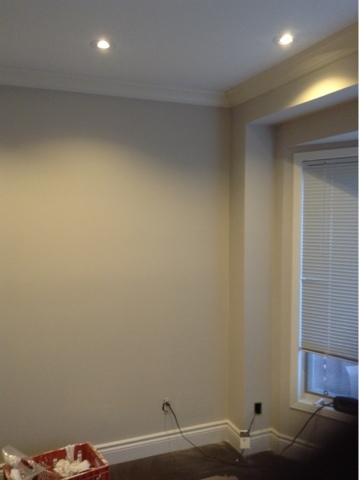 The ceiling in the kitchen/living room got a coat of paint. I think it needs 1 more. 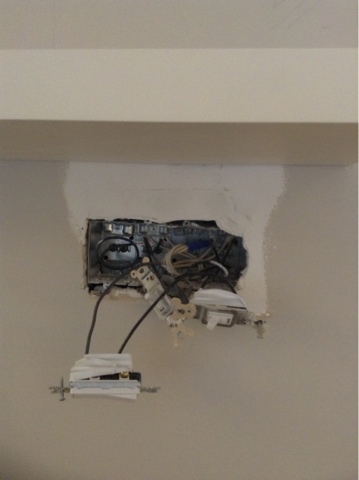 Rob the electrician came by today, but his vendor didn't have all the LED-capable dimmers he needed, so he'll have to come back next week to install those. Also, because the ceiling was wet, he didn't put up the pendants or the fan. 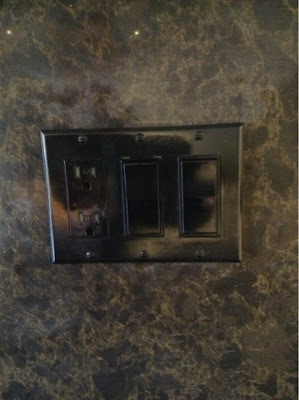 Since we have a dark colored backsplash, we made the last minute call to put in black switches and plugs. Glad we thought of that, because I think it looks great! ﻿﻿Rob couldn't find a black integrated switch/timer for the grow light, so we have a regular switch and I'll use a timer on the plug inside the herb shelf. Can't win them all. 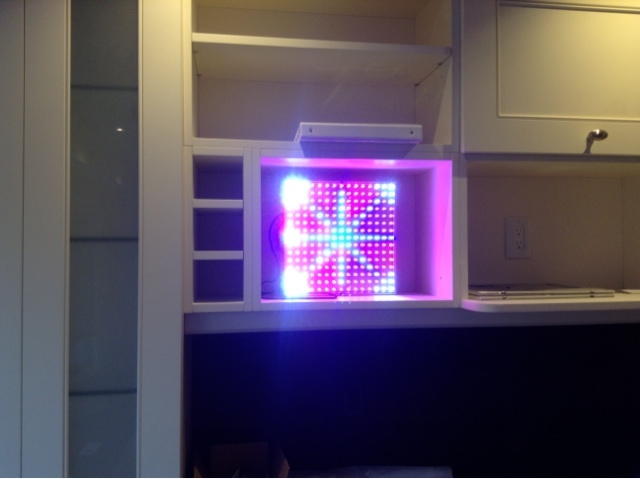 Rob had FITS over the grow light LED panel. Fits, I tell ya! He thinks it looks like a "Lite-Brite" (I loved mine; as an OCD child, I mostly just liked to make separate piles of the different colored bits...), and he REFUSES to take his final picture of the job with it in the shot. I'm not joking. It's not *that* bad. Note that it will be hanging and shining flat down, and not out, like a crazed Union Jack! And seriously, I need this shelf. Look what happens to my basil and oregano when left to my hubby's tender, loving care! It will be fine in the end, but needs some more mud (and we all know, mud=dust, so we're not done with that just yet). Front of hole, note the part above the electrical box. That's new. Oh, and don't put your finger in there. Live switches. I have the Ernest Hemingway of holes. Note the purple walls that remain...not for long! 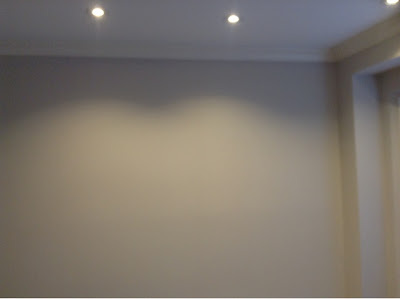 Once everyone else left, Jamie went to town on the living room and kitchen, and got a first coat of grey wall paint on. Inspired by my room at Frederick's Hotel in Maidenhead, UK! TOTALLY DIFFERENT room! Love it! 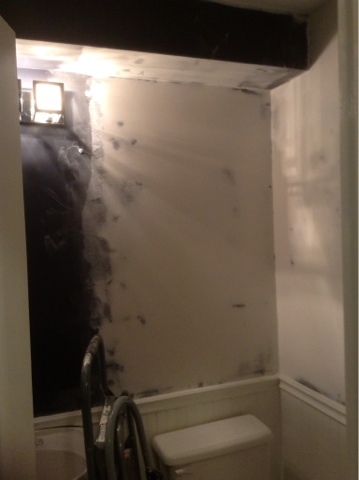 Plan for Day 13 - Jamie will tackle some primer on the walls of the powder room, second coat on the ceiling and walls of the living room and kitchen, more mud on the shelf wall (will have to finish that and the closet up on Monday/Tuesday next week, likely). Powder room, with the lumpy walls all smooooooothed out. Other things that need to be done-- the drawer with no hand-hold should be getting one, and I hope to see that again soon. We also need pistons to hold the upward-opening cabinets, well, UP. Justin said he saw those in the shop, so they should be installed here soon, I hope. Note the distinct lack of any way to keep this door open. It does soft-close though. Justin also said I'm doing a great job as the project manager. 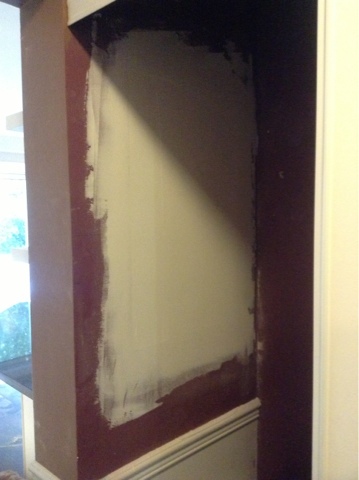 Kitchen Reno 2013: Day 11 - O, the DRAMA! Kitchen Reno 2013: Day 10 - The "crowning" glory! 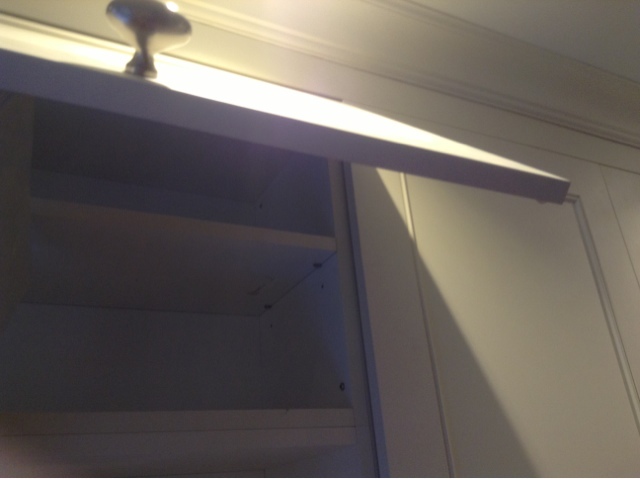 Kitchen Reno(vation) 2013: Day 4 - Surprise!